Submitted by The Amethyst Dragon on 2014-08-06 11:58. 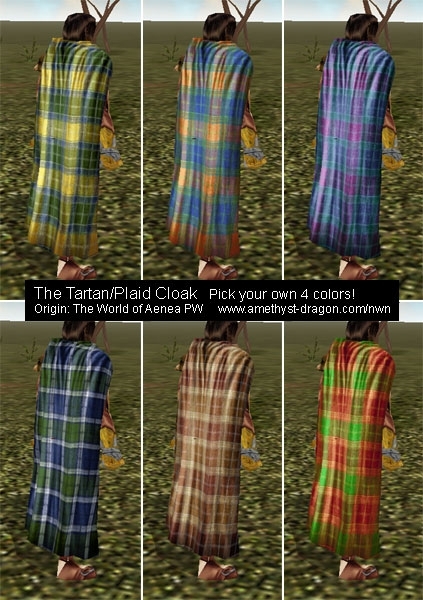 Is your clansman looking for a new cloak? Does he want something that matches the rest of the clan? Maybe she's looking for something with colors nobody else has. How about hundreds of different possible color combinations? I have been having great success developing my own custom cloak textures thanks to Lisa's examples, and have decided to give back to the community a bit by offering up a brand new cloak design. This is my tartan or plaid cloak texture. It uses any combination of colors in the Cloth1, Cloth2, Leather1, and Leather2 channels to enable a builder or player (with proper dye items) to create cloaks with many, many different possbile combinations of color for unique patterns. No Celtic warrior would be with one of these cloaks. Well done.